It’s out. 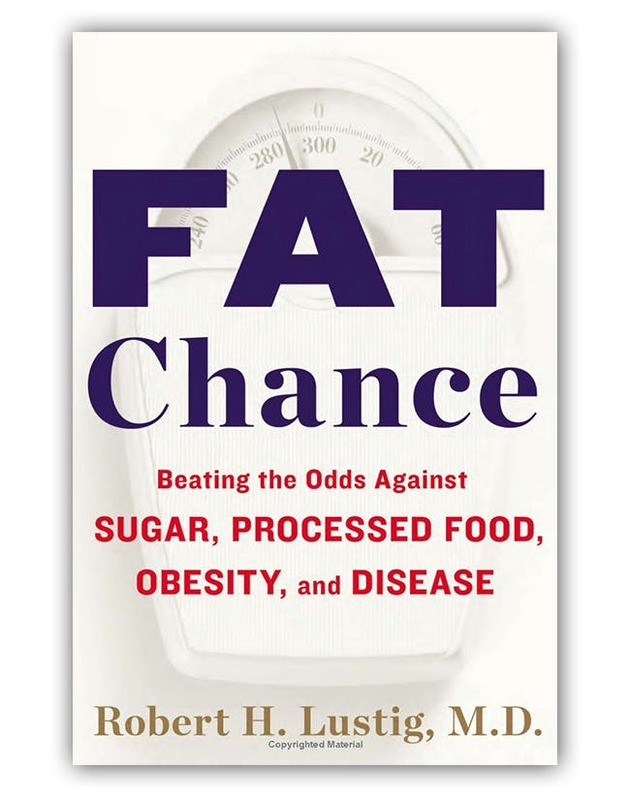 The book “Fat Chance” by professor Robert Lustig, the man who made millions of people watch a 90 minutes long lecture on nutrition (“Sugar, The Bitter Truth”). Lustig has the ability to make a subject exciting and his message could not be more important. I’m reading the book right now and I’ll return with a more thorough review. But I want to tell you right now. While it’s only January 5th and while I haven’t yet finished the first read-through I’m already certain: This is the book of the year. Why a calorie is not a calorie? Why obesity is not about gluttony or sloth? What the real problem is with sugar and processed food? The cause of the epidemics of obesity and related diseases? Here’s the answer (it starts with the letter “i”) in a fascinating read and with a concluding list of scientific references that should make the most inveterate critic give up. Read the first pages for free on Amazon.com. I felt that the book was pretty good. He does a good job of explaining the relationship between insulin and leptin which is something that I think some people have a hard time grasping. However, he focuses so much on fructose and sugar in general while simultaneously recommending to eat your whole grains?!? All in all, considering that the general public hasn't a clue about their diet and metabolism, this book would definately help them take a step in the right direction. Pretty sure the extra insulin from those whole grains is still going to work against peoples efforts if they already are metabolically comprimised.....Just a thought. Best of luck to him though, if this book does well, he will have achieved something by bringing the public one step closer to the truth. My first impression is that: as ever, he does not pull his punches and is not afraid to tell it like he sees it. I am glad to see another physician with real clinical experience in this field, as well as solid research behind his words. I hope that he wakes up a few more free-thinkers and ultimately affects policymakers. Thanks, DD, for the review. I'm so happy that you, Gary Taubes, Jimmy Moore, et.al. continue the fight while I happily go about my business losing weight on low carb, high fat. I talk about it if someone asks, but I don't debate, try to change minds, or even give advice. I do, however, send folks to your site and others. I'm so glad you are you!!!!!!! I've gotten wind of trend for paleo bigwhigs to be rejecting the "insulin hypothesis" and for stirring up some sort of battle with the ketosis-believers. What's up with that? I'd love someone's insight into the controversy and what is bringing it about. Peggy my advice is: not to rely on anyone else to be the "expert", "bigwig", "guru" or "whatever"... look critically at the evidence they present, see if it holds up to scrutiny, see if it makes sense to you, check it against other sources (do the same for them) and make up your own mind. If he really recommends eating whole grains I'd have a hard time recommending anyone read the book - shame. I'd much rather recommend they read Wheat Belly. I started my "journey" a year ago (New Year 2012) by giving up sugar. It wasn't until I gave up all grains that I truly found health transformation. Robert Lustig: And the answer is yes you can. The single best thing you can do for yourself quality of life-wise, exercise. By far and away nothing else comes close. The next thing that’s most important is when you’re eating make sure you have some fiber. Alec Baldwin: When people want to go eat fiber that you recommend they eat now where do they go? Robert Lustig: Very simple, brown food, brown and green. Okay if it’s brown and green its got fiber. Robert Lustig: ‘Cause fiber is brown. Wheat comes out of the ground. What color is it? It’s brown. You send it to the mill you make bread out of it. Now what color is it? Where’d the brown go? It got milled off. God made carbohydrate with inherent fiber. So we have brown rice, whole grains, beans, we have lentils. We have other legumes, we have nuts, they’re all just great. But as soon as you remove the fiber, which is called processing, now you got a problem. Because now when you eat it the sugar gets absorbed so fast that your liver gets overloaded, your mitochondria basically get sick and now you’ve got insulin resistance and how you’ve got all the diseases going downstream from there. Alec Baldwin: Do people need to have an elevated level of consciousness and discipline about eating pasta, rice and potatoes as well? Robert Lustig: At the moment they do. Seems, as others have mentioned, that Lustig is not tellling folks to go ultra low on all types of carbs. Not if the carbs are the types he recommends. Of course he is OK with meats, etc. but he is certainly not a "born again" butter and bacon booster. Most Americans will benefit from following his advice compared to their current diet. Certainly eliminating sugar and refined carbs is excellent, as is eating more green veggies. I have read the book and think its great. In USA they put big amounts with sugar in everything. They need a revolution against sugar and the book is a beginning. I hope a lot of people will read it. Even if I am Paleo/LCHF I do not excpect everyone to follow that bandwagon. It depends how you tolerate carbs and R Lustig do discuss different diets in his book.If half of all American would follow his suggestion it would make a big difference. Just imagine less sugar and processed food. Please read the book before guessing about what Dr. Lustig says, especially about whole grains. Dr. Lustig makes a firm distinction between true whole grains, i.e. bulgur, and whole grains ground to powder and added in small proportions to white flour to be used in so-called 'whole-grain' bread and pasta. I am not a grain eater myself, but I do understand Dr. Lustig's logic on this topic. I like the book even if every word of it does not apply to me. It's a call to action for people, academe, and governments around the world. "I've gotten wind of trend for paleo bigwhigs to be rejecting the "insulin hypothesis" and for stirring up some sort of battle with the ketosis-believers. What's up with that? I'd love someone's insight into the controversy and what is bringing it about." this mostly seems to stem from young(er) lean fit and active paleo types who exercise regularly and add in "safe starches" but without increasing calories and find they maintain weight and don't get fatter. i don't see this as being particularly convincing evidence personally. I think that's fair enough Eddie. Not all bodies are the same. My body couldn't cope with LCHF, although I tried to make it. Now I just make sure I eat no sugar or vegetable oils and have lots of sat fats and no refined carbs and I feel great. He says a lot that supports a lCHF diet without actually endorsing such a diet, and has several bones to pick it sounds like with proponents of the diet like Atkins and Taubes. One, he said in the Moore podcast that he doesn't believe low carb is the only or even best way to go, and two, he said that his problem with Atkins (and I think Taubes) is that they don't distinguish between good fats and bad fats. All agree transfats are poisons, but I understand him to say eating red meat isn't so good for you (at one point, he said if you eat corn fed fish, you might as well eat steak). Feel free to correct me, as I have not read the book, and I'm going off what I heard him say (while trying to do some other things). Another recent good interview with Dr. Lustig is by Diane Rehm, appearing at http://thedianerehmshow.org/audio-player?nid=16890. The entire program is well worth listening to; for me, the high point came very near the end of the almost hour long interview, when a dietician called in, trying to promote the usual "a calorie is a calorie" rubbish that is so common among her profession, and Dr. Lustig in his reply rebutting her in no uncertain terms. You've really hit the "wheat" on the head there, Frank. I completely agree. By reading a variety of books and critically examining them and then self experimenting is the way to go, rather than picking and choosing pieces that you agree with and discounting the rest. I have both Wheat Belly and Fat chance and they both have valuable lessons. Excellent book filled with strong scientific evidence, fully referenced. If this book can't convert you to eating low carb low sugar (i.e. nothing that will raise your insulin levels) diets, nothing will! Just got around to reading Robert Lustig's Fat Chance. ad libitum. Hello insulin! Calling Dr. William Davis! The book is tedious because it is so repetitive. find that quote, but the index is woefully inadequate). The book is highly repetitive. a good understanding of the reasons for both LC and HF. He doesn't seem to have a good grip on them. sugar, and roughly half high-fructose corn syrup). Say what? haven't taken them off yet."pg. 69 Physician heal thyself.